Southern Arkansas University is hosting a dedication ceremony of the Sturgis Auditorium at the Wharton Nursing Building at 11 a.m. on Friday, January 8, 2016. The public is welcome to attend. Light refreshments will be served. This event is recognizing the generous gift of $40,000 by the Roy and Christine Sturgis Charitable and Educational Trust. 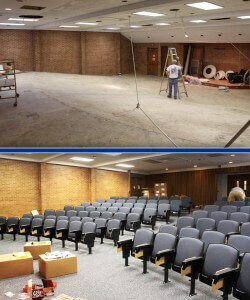 The donation helped fund recent renovation of the lecture hall, combined with support from alumni and friends who purchased seats through the Name-A-Seat Campaign. The renovation of the Wharton Nursing auditorium was important because it is a high-use area where more than 200 nursing majors meet for instruction throughout each semester. Upgrades in the renovation included new auditorium seats with larger laptops, lighting upgrades, new carpet, fresh paint, and an upgrade in wireless internet capabilities. According to the SAU Physical Plant Associate Director Robert Nash, the project started with workers completely gutting the space and removing the outdated projector room. By removing the projector room, the auditorium gain much-needed space. There is still time for alumni and friends of SAU to purchase a seat for $250 in the auditorium. According to Kee, this is a great opportunity to remember a loved one, honor a friend, or recognize a cherished faculty member while helping in the education of our future health care providers. To purchase a seat, click on the “Make a Gift” button at www.SAUFoundation.org or call 870-235-4078.